I organization for a job well done. and to extend . | Panama and to our friends throughout the world. SAirs. Fleming joins me in wishing all of you a "
a truly Merry Christmas and Happy New Year. 3 to your loved ones. SCGovernor of the Canal Zone. .. .* ...:9;, r",:w 77 7"'y /''. .. . .... ... S. e .. .
of Panama, and the world. Spoken, it's in many tongues. season, see pages 4 and 5. 50 feet across the open area. Natural Bridge over the Rio Puente. coral and shells embedded in the rock. when the lake is full. objective for hikes and campouts. near Santa and the traditional reindeer and sleigh near the base of the tree. reindeer are familiar holiday sights. and they make their own welcome. and carport areas the year 'round. for delivery someplace in outer space. lend a classic-modern touch to some homes. at all on the Isthmus. first onto a small porch. No chimney. all-light Christmas trees in the yard. holiday scene in Latin America. Calvet, Maria Sanjur, Gladys Urefia, Ana Cardoze, Nereida Mendez, and Luis Calder6n. certificate, was unable to attend. and 1 week in July, including July 4.
founded 5 years ago to provide a meet- "-"
on a friendly, informal basis. Two years -' .-"
Cultural Institute in Colon was opened. Opening of an art exhibit attracts art-lovers, young and old, diplomats and business people. association in its academic program in- scanned the program. P- out of the Binational Center's doors. 07 hUniversity students for language study. haunts. Many regard this as one of the most beautiful views on the Isthmus. taken from the Camboa club porch. Division, to Window Clerk, Substitute. munity Services Division, to Laborer. Nada I. Durham, Clerk-Typist, to Clerk. Branch, Supply Division, to Signalman. Herman Small, Laborer (Cleaner), to Clerk. (Electrician), to Control House Operator. Machinist, to Lock Operator (Machinist). Dodson Hinds, Messenger, to Timekeeper. Clerk, Supply Division, to Cargo Marker. Service Center Branch, Supply Division. American Cultural Institute in Colon. the Treasurer, Panama Canal Company. tic Side; 13 years, 2 months, 6 days. Division, Pacific Side; 35 years. Side; 16 years, 9 months, 4 days. Division, Pacific Side; 33 years, 29 days. 40 years, 6 months, 24 days. families in Colon and Panama. to attend the Pan American Conference. to have the pact ratified. from Washington, D.C. that the U.S.
larger ships than the existing locks. by Gov. John S. Seybold and Mrs.
would operate it as a private enterprise. Canal. In recognition of his feat, Gov. located in the townsite of La Boca. Side; 19 years, 9 months, 17 days. sion, Pacific Side; 14 years, 8 days. Hospital; 10 years, 3 months, 7 days. SBefore deduction of any operating expenses. Line for delivery late in 1965.
as they float and can fit into the locks. she had a 400-foot dry dock in tow. York to Far East service via the U.S.
21 knots and is fully air conditioned. *0Cargo figures are in long tons. sands of tons of iron ore from Peru. lumber and oil to bananas and barley. PSNC since her construction in 1955.
the ships using the Canal. 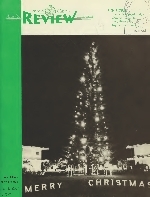 A huge Christmas card shares top billing with a huge lighted tree. Artistic balance plus a framework and background of candy canes and hundreds of lights make this display all but overwhelming. There are huge bows on the big canes, an elfin-angehc musical group near Santa and the traditional reindeer and sleigh near the base of the tree. A Canal theme: A model "mule" with line attached to a small boat transiting Santa, an elf and a bag of toys. ChriAtmaA ligltt* don 't create muck neat. JuJt enough to warm heart i. There's no snow on the Isthmus, so our snowmen are synthetic, but not our sentiments. Deer are natives hereÂ— not the North Pole breed of reindeerÂ— but models of reindeer are familiar holiday sights. So are elves and gnomes, native to all parts of the world as Santa's helpers, and they make their own welcome. Newcomers or visitors to the Canal Zone often express amazement at the elaborate Christmas decorations at many homes. And are surprised and warmly pleased to find that quite a few residents keep festive lights in patio and carport areas the year 'round. On these pages are views of some of the decorations that bring "oohs" and "ahs" from small fry and adults alike as they tour Zone residential sections at holiday time. J ^ Traditional characters, the elves, and a traditional winter scene at top right share billing with the most modern of touches, a missile complete with lighted nose cone tip. And presents are being loaded aboard for delivery someplace in outer space.